Fishing With Flies :: Blog: Panasonic TS3 ups the ante over the new Fuji GPS-featured waterproof camera by throwing in GPS, barometer, altimeter and compass! Panasonic TS3 ups the ante over the new Fuji GPS-featured waterproof camera by throwing in GPS, barometer, altimeter and compass! In my last post I was pretty excited about the new Fuji "tough" camera that included GPS. But my favorite modern "tough" cameras are coming from Panasonic, and Pany has just upped the ante. Their new model (there are actually two new models, but I view the one shown here as the better one) is the DMC-TS3. 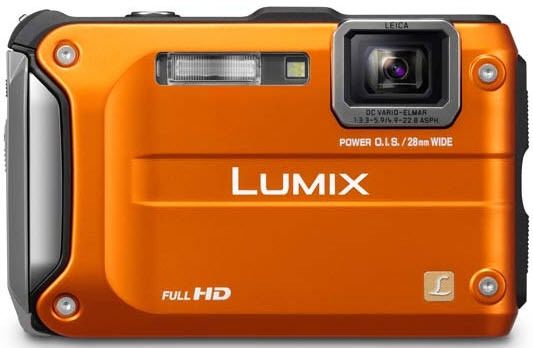 I'd add a link to the panasonic Web site, but the camera is so new (and not yet available) that it is not yet on the panasonic USA Web site. I don't know how the image quality will be but I like the fact that this has fewer pixels (12 megepixels) than the 14 megapixel Fuji. Even 12 megapixels is way too many on a camera with such a small sensor. But more pixels is what marketing departments want. Image quality would be far better with 6 megapixels on sensors of the size of 99% of all pocket cameras. Did you know that even on a 24" monitor that images are downsized to about 2 megapixels to fit?! About 5 megapixels is all you need for an uncompromisingly sharp 8"x10" print. I've even had some gorgeous 9"x12" prints from my old Pentax 3.3 megapixel waterproof camera. The problem with more pixels is that the camera's ability to take low-light images is decreased and there is much more noise (grain) in the image... all else being equal. Pretty awesome, I would say. Do you have any idea on the price point for a camera like this? Steve, I don't think it is published yet. The older one looks the same, but doesn't have the features listed in the blog title above. It is selling for about $250 and I think it came out at $399. Prices a very much discounted after a year into the cycle. That looks like a fine piece of light capturing equipment alright. Hi Robin, The ol' 33WR is pretty old technology now. If the sun is at all in front of you, the Auto White Balance doesn't always work well so I switch to "sunlight" or "cloudy" or whatever. With Auto White Balance the sky often picks up a green or purple color cast depending on the angle of the sun. But when the sun is behind you (over the shoulder) the colors are good. And of course that little LCD can be hard to see... especially with polarized glasses *LOL*.